Last quarter, a few PUC physics students were given the opportunity to visit and assist with research at Oak Ridge National Laboratory (ORNL) in Tennessee. The idea was to give the students hands-on research experience in order to explore what research is like in a laboratory setting. PUC is one of three collaborative institutions working with ORNL and the National Aeronautics and Space Administration (NASA) to investigate X-ray-induced charge transfer. To do this, there are two different sets of measurements that must be considered: the rocket measurement (aka: “all sky survey”) and the laboratory measurement. The former is done by NASA, the latter by ORNL, using the same rocket. 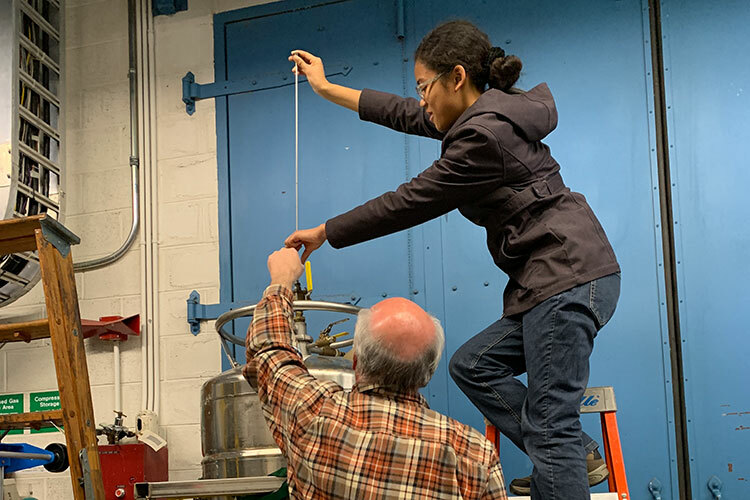 While at ORNL, Andrianarijaona and her fellow PUC students participated in fine-tuning the ion beam to optimize the measurements taken by the rocket. This must be done for high-sensitivity measurements, including adjusting diffraction gratings via computer, reading the ion beam current via ammeter, and recording the current of the ion beam vs. time. This visit to ORNL was made possible through Andrianarijaona’s father, who shares her name and is a physics professor at PUC. His connections with ORNL extend into a research grant he acquired in 2016, allowing him to get undergraduate students involved in the work. Andrianarijaona agrees visiting and working with researchers at ORNL was eye-opening and inspiring. For more information about the physics program at puc, visit puc.edu/physics or email physics@puc.edu.